tl;dr There’s a Lazada video that has garnered 1 million views to date featuring a fake Pusheen. Pusheen is a product distributed by my company Being Kids. Lazada’s video showcasing fake Taobao Pusheens hurts the brand and my customers. Lazada is really using the popularity of Pusheen to push it’s “Taobao Collection” through this video. 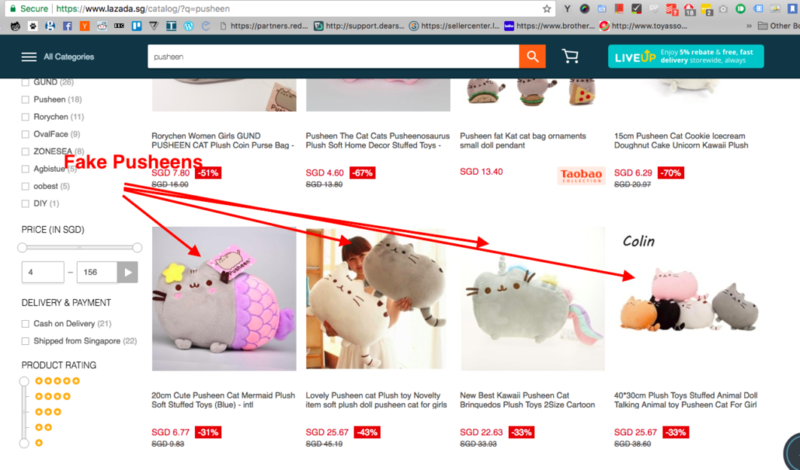 Could Lazada not have used a real Pusheen instead? 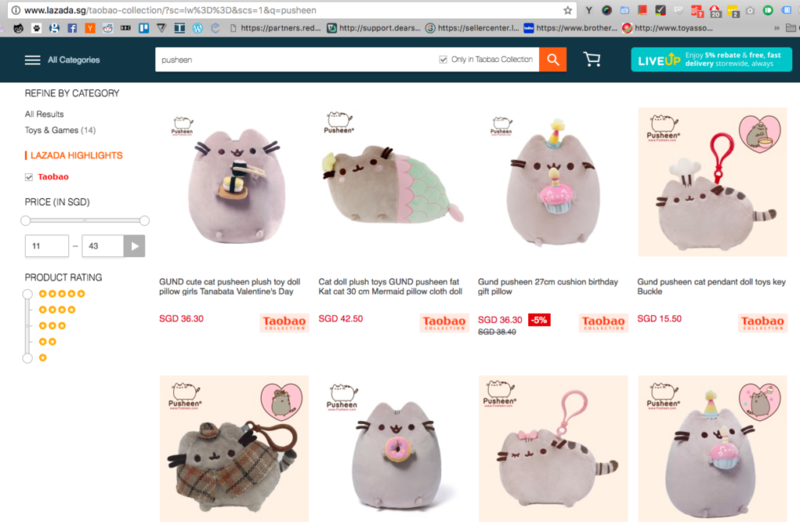 Lazada’s Whatever Makes You Happy – Taobao Collection features quite prominently a Pusheen plush toy. To date the video has been seen 1 million times on Facebook and further 300,000 times on YouTube. Pusheen gets some serious air time in this video, about 20 seconds from this 54s clip. 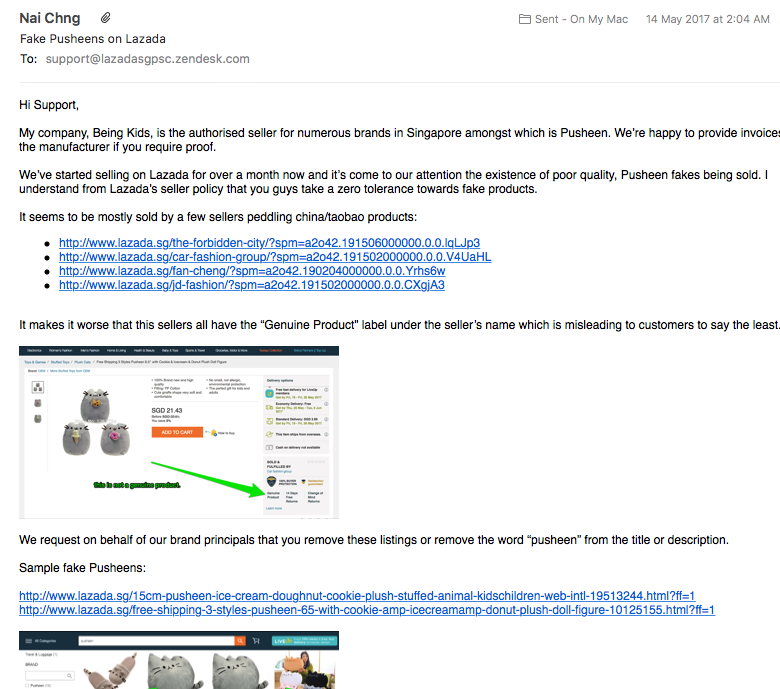 As the official distributor for Pusheen items in Singapore, I should be thrilled, except I’m not. This is because the Pusheen used in the video is a fake pusheen. 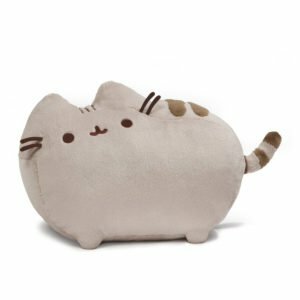 A real Pusheen plush looks like the image below. The fake Pusheen is a poor poor imitation of the real plush toy. And honestly, it pisses me off that 1.3 million people have seen a fake Pusheen instead of the real one. 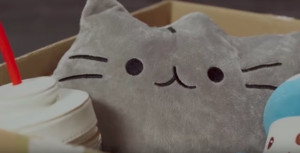 The fact remains Lazada is using the popularity of Pusheen as part of this promotional video and chose to use a fake Pusheen instead of the real one. Well, I think the animated Pusheens strongly suggests otherwise. Taobao and Fake Products. What is Lazada Going to do? Now that Lazada is really just a front for Taobao, it’s no surprise that Lazada Singapore inherits Taobao’s numerous product quality issues. 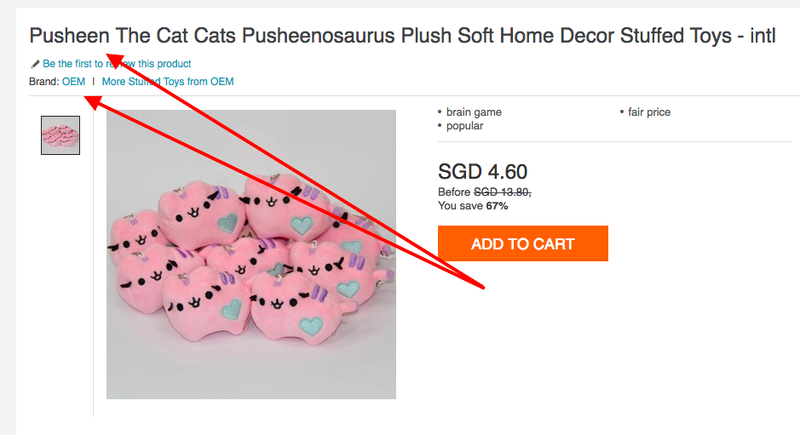 Looking at Lazada product listings for “Pusheen”, it’s clear there are sellers selling fake Pusheen products. So this is a known problem. 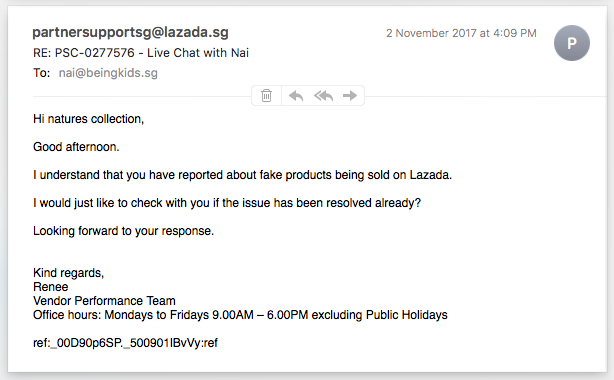 The question is: what will Lazada’s management do to combat fake products from spoiling the customer experience? In short, the idea is for you to differentiate your items by your product content to get the public to buy original. – Lazada Account Manager. Note the date, 30th June 2017. This issue has been on my chest of a few months now and the promo video was what tipped it over. I’ve also submitted a list of URLs for removal on the 14th of May. The fake items are still there. Ignoring the absurdity of using content to differentiate real from fake (My product is real! No, my product is real! 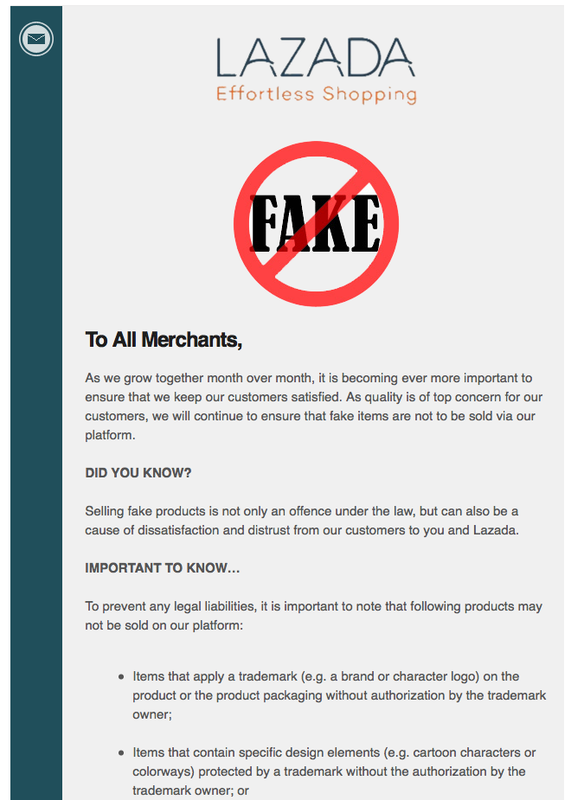 ), Lazada doesn’t really have a plan to combat fakes. 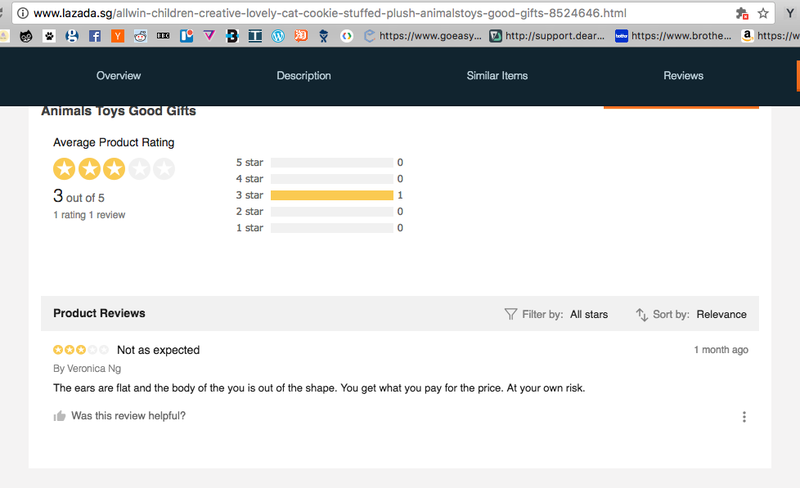 Also, what’s stopping fake Pusheen sellers from making their product listings look real too? To be fair, they do have a process to address such issues but the process is super tedious. The burden of responsibility falls on brand owners and brand representatives. Essentially, we have to do Lazada’s job. The problem with fake products is that it not only hurts the brand, my customers and my sales, it also makes for a poor user experience. So if the CEO is saying things like “Live and breathe the customer experience everyday” but at the same time still allowing counterfeit products to proliferate, you have to wonder how much of this is PR talk. It’s also quite ironic that all sellers receive the following on-boarding email from Lazada. OEM items should not state that they are linked to genuine products/brands. Granted Lazada is not the only company to have such issues. I’ve come across fake Pusheens on Carousell, Shopee and q0010 (duh). It’s not an easy problem but when a startup is pursuing growth, policing for fake products can’t be too high on the agenda. Getting rid of fake products is one of the areas Amazon does well. Now that they are here in Singapore, I hope Lazada and gang will up their game as well. Selling on Amazon has it’s own issues but you will not find a fake Pusheen in any of their listings. While I’m on this topic, I might as well talk about the differences between a real Pusheen and a fake Pusheen a.k.a fauxsheen. Real Pusheen plushes are manufactured by Gund, a 100 year old American toy manufacturer. There are a few tell-tale signs to spot the difference. Price. All real Pusheens in Singapore are price-controlled by us. Every retailer in Singapore is selling the same item at the same price. If it’s too cheap, it’s probably fake. Lenticular Tags. All real Pusheens come with 2 tags. 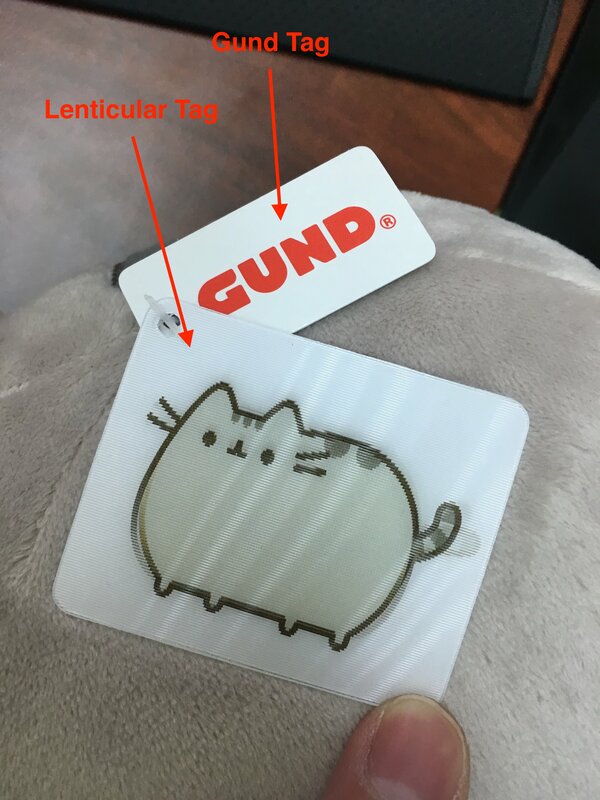 A Gund tag as well as a Pusheen lenticular tag. Look and feel. Real Pusheen plush toys are proportionate. The fake ones look misshapen and are poorly made. Is it sold by an authorised retailer? If you’re not buying from a customer on this list, second-hand products not withstanding, you’re probably purchasing a fake Pusheen. All Pusheens deserve love. It’s just some deserves more love than others. Lastly Lazada, if you ever need Pusheens for your promo videos, get in touch. I send you legit Pusheens FOC. While browsing the Taobao Collections on Lazada, I came across this banner. See that Elephant plush toy? His name is Flappy. How do I know his name is Flappy? 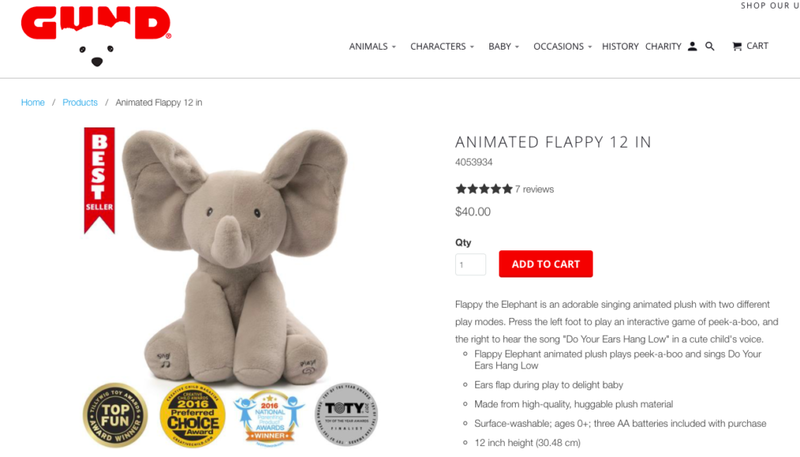 Because Flappy is a Gund product, a brand we also represent. Of all the elephant plush toys in the world, Lazada had to pick an award winning Gund Animated Elephant to promote their Taobao Collection. Surely there has to be some copyright infringement in using this image without consent from Gund. I reached out to Lazada around the 3rd week of October. It’s the 17th of November and I’ve yet to hear back from them. It’ll be nice to at least have someone at the right level in management, reach out and say they are looking into it. It feels like no one is taking ownership of this problem which is indicative of how much fake goods are a “top concern” for them. On the 4th of December, a real person from Lazada finally gets in contact promising an official reply by 6th December. 6th December came and went and no official reply was had. We apologize for the delay in getting back to you on this matter. As Lazada Singapore does not stand for counterfeit, we are working to immediately de-list these items. We will also be removing any promotional assets that showcase them. Lazada has strict procedures in process to ensure that counterfeit items are not listed and removed when brought to our attention. As far as I know, there are no strict procedures to ensure counterfeit items cannot be listed. I’ve uploaded over 600 products to Lazada and there was absolutely no checks to ensure the authenticity of the products; which all so happen to be authentic. The Facebook video seems to have been taken down. Youtube video is still up. 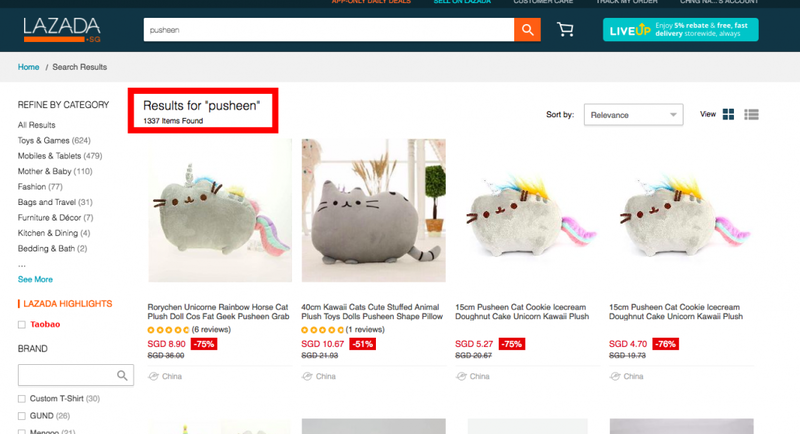 Still tons of fake Pusheens on Lazada. In fact it seems to be getting worse. Pusheen search term returns 1337 products. Of this, only 21 are shipped from Singapore. I dare say that the rest of these 1316 Pusheen products are either fakes or parallel imports. As a Singapore Seller, I can’t help but feel like a second class citizen on Lazada.sg. Lazada, if you’re reading this, there are only 2 questions that needs answering. Who’s taking ownership of this problem? What is being done to prevent the sale of fake products on your website? I will no longer be pursuing this as it’s a massive waste of time and a distraction from doing things that actually add value to the company. Being Kids is a toy and gifts distributor based in Singapore. We represent brands such as Gund, Pusheen, Sesame Street, WWF Plush and more. Our products are in over 70 locations in Singapore.